When it comes to the IT your business relies upon have you ever thought if there is a better way to have it delivered? Until recently, we have lived in a world full of technology for its own sake. We mean technologies called mainframes, mini-computers, PC’s, laptops, networking gear, big software, PBX’s, etc. These were all considered necessary for businesses to function. In this model, businesses like yours received technologies from resellers who delivered and maintained this on-premises tech. There wasn’t much in terms of solutions that focused on your business goals and objectives. Today, we have cloud computing and through working with a Modern Services Provider like Netcetera we can ensure that the technology you need is not only delivered but that it is also fully supported. Netcetera is much more than a technology provider, we deliver an integrated portfolio of managed services that can bring significant value to your business. Netcetera is a Modern Managed Service Provider, specialising in delivering hosting solutions that are aligned to your business needs. We are a service provider that not only delivers cloud-based IT services but we also provide all the support you need to get the best from these technologies. 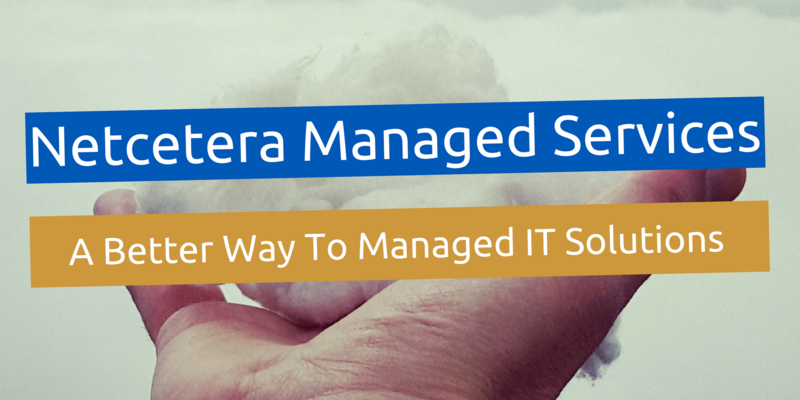 Managed Services from Netcetera can not only save you money and improve your business efficiency but they will also ensure your business has a reliable well supported IT infrastructure. Our Managed Services offer a complete solution for you IT needs. Full Cloud and Dedicated Server Management is available as is fully Managed Backup Solutions. Combining both will give your business an all round solution that doesn’t just deliver the hardware your business relies on, but also all the support you need to benefit from the advantages of the latest innovative technology available. This business technology partnership eliminates the high cost of hardware and software. At significantly lower costs, businesses can apply cutting edge technology to improve their competitiveness, productivity, cost efficiency, and the security of their data and assets. With prices for Netcetera247 Desktop Complete from only £5.00/pm, Mobile Complete from £6.00/pm and Netcetera247 Server Complete for only £50.00/pm, Netcetera has a Managed Service to cover all of your business needs regardless of the type of IT you rely on. Our Managed Services have been delivering cost efficient savings for over 20 years and through choosing to partner with Netcetera you’ll soon see why we have attracted thousands of clients from around the world who now rely on our solutions to deliver all of their business needs. If you’re thinking about upgrading your existing technology it’s now time to speak to Netcetera to find out how our Managed Services Solutions could save you money and benefit your business. If you would like to discover how Netcetera can help your business benefit from innovative Managed Services visit our website today and make your IT work efficiently for your business needs today.